VATICAN CITY (CNS) — Marking the Pontifical Academy for Life’s 25th anniversary, Pope Francis encouraged the research and advisory body to promote human solidarity and fraternity as part of its mandate to promote human life. 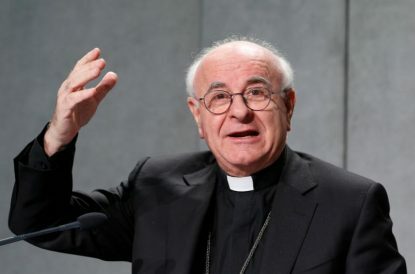 Speaking to reporters at a Vatican news conference Jan. 15, Archbishop Paglia said the letter’s title, “The Human Community,” indicated how the pope wants pro-life concerns to include a concern for human relationships — in the family, in society, among nations as well as with creation. The pope sent the letter to mark the 25th anniversary of the academy’s establishment by St. John Paul II on Feb. 11, 1994. People’s awareness of this paradox often leaves them “demoralized and disoriented, bereft of vision,” he said, and in even greater need of the hope and joy offered by Christ and of a taste for the beauty of a life lived in fraternity with others on the earth as a common home. “A sign of this is its constant effort to promote and protect human life at every stage of its development, its condemnation of abortion and euthanasia as extremely grave evils that contradict the spirit of life and plunge us into the anti-culture of death,” the pope wrote. The pope’s letter, “Humana Communitas” can be found in English here.